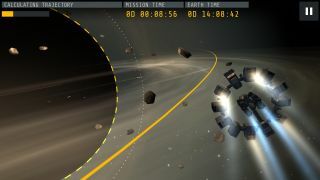 A screenshot from "The Interstellar Experience," a free new game that lets players explore the universe depicted in the upcoming sci-fi film "Interstellar." Christopher Nolan's mysterious, highly anticipated film "Interstellar" won't be released until November, but a new app lets you get a taste of the movie's themes and thrust right now. Today (Sept. 18), Paramount Pictures released "The Interstellar Experience," a free game that lets players create their own solar systems, explore systems created by other users, travel through wormholes and fly past black holes in the Endurance, the spaceship featured in the upcoming film. The movie "Interstellar" launches into theaters in the United States on Nov. 7. The game has some science chops as well; the Endurance cruises through simulated gravitational fields endorsed by Caltech theoretical physicist and "Interstellar" adviser Kip Thorne, Paramount representatives said. You can play "The Interstellar Experience" online at game.interstellarmovie.com or download the app for free at the Google Play Store. An iOS version of the app will be available next week. The game should build even more buzz around "Interstellar," which already has sci-fi fans crossing off the days left on the calendar until Nov. 7. Nolan and Paramount have long been tight-lipped about the plot of "Interstellar," which stars Matthew McConaughey, Anne Hathaway, Jessica Chastain and Michael Caine. But a trailer released in May revealed the basics: Earth has run out of food, so McConaughey's character and other explorers set out on an interstellar journey to save the human race. "We're not meant to save the world. We're meant to leave it," Caine's character, a professor, says in the trailer. "We must reach far beyond our own lifespans. We must think not as individuals, but as a species. We must confront the reality of interstellar travel." In the film, that reality apparently involves exploiting wormholes, tunnels through the curving fabric of spacetime that can connect widely separated points. Nolan is known for such films as "Memento," "Inception" and the "Dark Knight" Batman trilogy. "Interstellar" is based on a treatment penned by Thorne, who has studied the physics of wormholes and black holes, among other things, during his scientific career. The Interstellar Experience is available online, as well as through Google Play and Google Chrome.